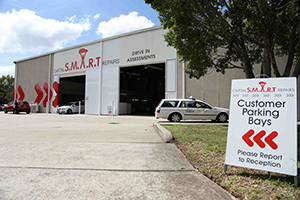 The S.M.A.R.T centre is located on the western side of Silverwater Rd. We are on the corner of Fariola and Egerton Streets. When dropping off your car please park in the assessment bay, which is through the right hand roller door next to reception. Please walk in to reception where Customer Care will greet you.